Our travel agency clients in-store advisors provide tailored holiday advice to customers, to help them discover and book their ideal holiday. Its website displays a variety of holiday offers to customers online, but previously had no way to transition customers into store if they wanted a more personalised advice. As a result, many customers would walk-in to stores, often during lunch-breaks or at weekends, which could lead to busy stores and lengthy waits for service. A holiday is also a complex purchase, with customers often requiring multiple conversations and time to process information before making a decision. To support the bespoke service provided to customers and to ensure conversion, our client needed a way to help its staff arrange follow-up meetings with customers in a personalised way. The travel agency implemented Qudini’s Appointment Booking system into its new stores concepts, in order to connect its digital channels with the in-store customer experience. Appointment bookings: Customers can now use the travel agency’s website to find their nearest store and book an appointment. Links to the online appointment booking interface have also been placed on the Facebook pages of each individual store. Each booking customer receives a personalised branded confirmation of their appointment and, in advance of their appointment, they also receive personalised reminder notifications. Store staff are also now able to view details of their upcoming appointments and better prepare for each customer’s needs in advance. Walk-in management: In our client’s high-footfall store locations, the Qudini queue management interface is further used to manage the many walk-in customers throughout the day, looking for holiday advice or travel money services. Using Qudini, a receptionist will provide the customer with a service time estimate and add their name and smartphone number to a digital queue, enabling the customer to relax whilst they wait, engage with the information in the store, and receive SMS updates as their turn arises. In-store bookings: If a customer needs more time to decide, the travel agency advisor can book a follow-up appointment, which can then take place back in-store or over the phone. The direct result of implementing Qudini’s Appointment Booking system. Qudini adds value to all the travel agency stores. Staff are now better prepared for each customer and can deliver a more tailored service that leads to conversion. As a result, our clients stores have seen their total store conversion increase by 10%. After placing a simple “Book Now” button on a store’s individual Facebook page, booking volumes doubled – demonstrating the significant opportunity to increase in-store footfall using a variety of channels. 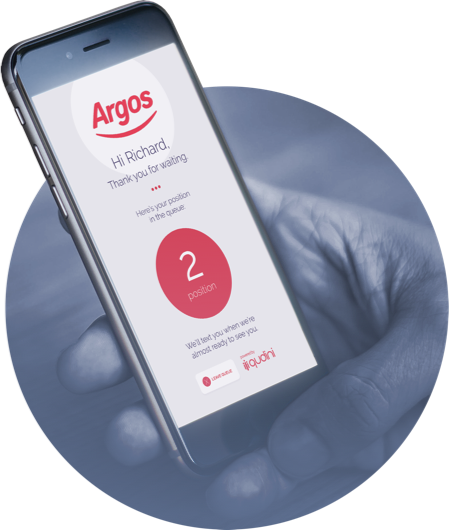 Now that walk-in customers are provided with estimated wait times and personalised updates, more customers are willing to wait in-store for their service. Furthermore, customers who don’t want to wait will book a follow-up appointment. Previously, stores were planning follow-up calls on paper, which were hard to track. With Qudini, follow-up calls are booked in, ensuring that each customer receives their scheduled call within the agreed timeframe. Now that customers can pre-book a fixed follow-up appointment, the majority of customers adhere to this time, ensuring they return and that staff are prepared. 99.44% of customers say that Qudini gives reassurance that they are being taken care of. Qudini adds value to the customer experience. Qudini provides more granular detail to support our client’s footfall data, and provide data on what happens after customers enter a store. 23% of customers visiting the online booking page will book an appointment in our clients store. 60% of these customers are new/first time to the travel agency. Qudini’s store manager dashboard and in-app shop floor management functionality enables the store manager to better plan and manage their shop floor. Now that stores are able to better manage customer volumes during peak times.